Live Laugh Decorate: Hooray, The ORC is Back! Hooray, The ORC is Back! 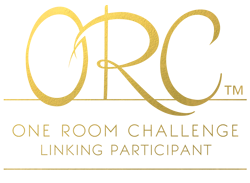 The One Room Challenge, my favorite online design show addiction, starring non other than design bloggers, is back in full force today. Yes, the ORC, the brainchild of blogger Linda of Calling it Home, is my official design drug of choice. This time around I'm not only staying riveted each week to see how these 20 designers transform their spaces, I'll be jumping in via the Linking party every Thursday. Daunting? Hell yeah. I barely got time to scratch my extra large booty, but I'm a sucker for the pressure of a deadline, and a deadline is what I needs to get me cracking on designing each room in our new purchased and heavily renovated house. Stay tuned for all the details tomorrow as I dive right in. It will be nothing short of nail-biting, if not hilarious as I try to juggle a jampacked roster of clients and tackle my own home. I guess I won't be sleeping for the next 6 weeks. Congrats on the new venture! I'm sure you'll be killin' it in the texture department! Love what you did with that Hollywood dining room, the wallcovering was sooo good!